The Lansmont PDT-56ED is the enhanced version of the PDT-56. This Drop Tester is perfect for those applications where drop heights are frequently changed or heavier packages need to be tested. The PDT-56ED features an electric hoist for raising and lowering the drop leaf assembly and test package, giving it infinitely variable drop heights from 11 inches (279 mm) to 72 inches (1829 mm). 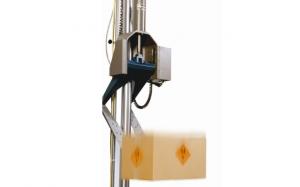 Drop Test options are available for tests requiring lower or higher than standard drop heights. For accuracy, the PDT-56ED employees a unique pneumatic brake system that, when armed, locks the drop assembly to the guide rod. This brake system insures no motion from the firing of the pneumatic cylinder will affect the motion of the falling package. All control functions of the Lansmont PDT-56ED are accomplished through the use of Lansmont’s MicroTest™ controller. This controller is a rugged, hand-held microprocessor based control system that allows operators full control over the Lansmont PDT-56ED. Among its many features are the ability to set drop heights, move hoist up and down, remember set drop height and return to that drop height automatically with the “Height Return” function, arm and drop the platen assembly, and switch operation to the included footswitch, when desired. The large LCD screen reads out current height, set drop height, and can be switched between inches or centimeters. All controller settings are retained in a memory, even when power is off. Controls MicroTest™ Controls for quick test set-up and elimination of tape-measures and rulers for measuring drop height. Features High-velocity pneumatic cylinder and unique brake system allow extremely accurate flat drop testing that exceed industry standards. Positioning Electric hoist for positioning drop assembly and lifting heavy packages. 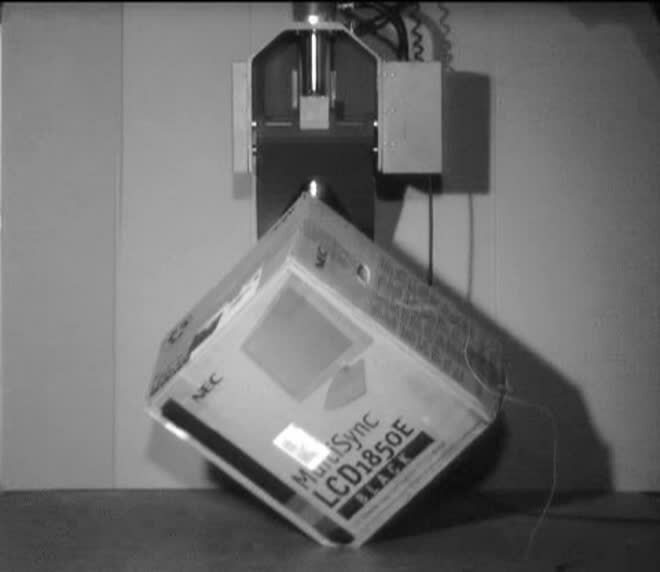 This video shows a slow motion capture of a packaged LCD screen being dropped using a Lansmont PDT-56 drop tester. Note how linear the drop is, there is no rotation and therefore a perfect corner-drop is attained. 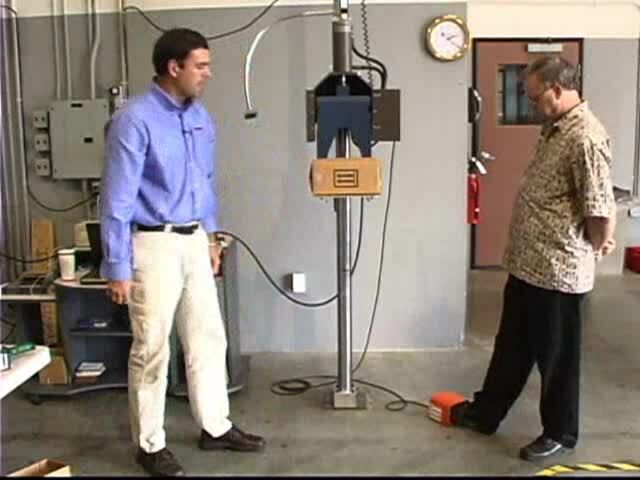 This video provides a quick introduction to drop testing using the Lansmont PDT-5ED. Presented by Eric Joneson of Lansmont and filmed at Lansmont’s Lansing facility.